Pope Invites Israeli, Palestinian Leaders For Joint Prayer Session : The Two-Way Israeli President Shimon Peres and Mahmoud Abbas, the Palestinian president, have agreed to attend the joint prayer meeting at the Vatican, set for next week. 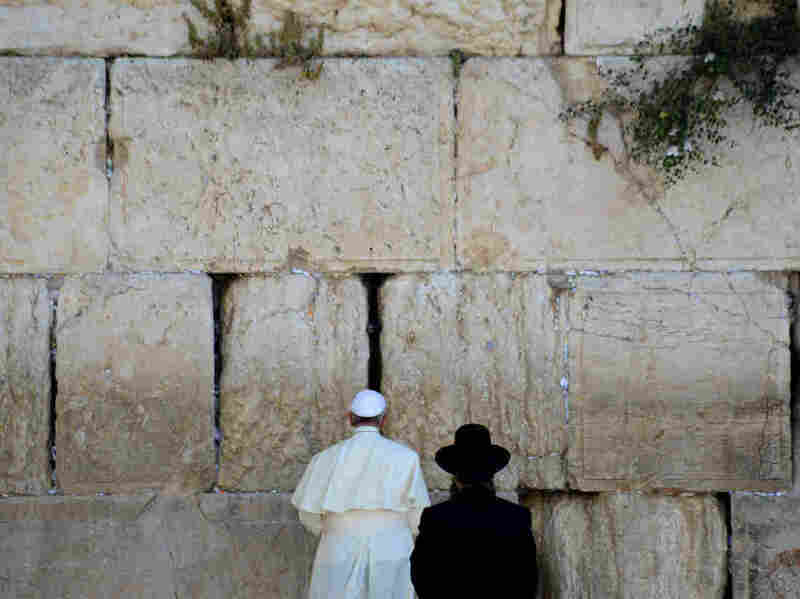 Pope Francis prays during a visit to the Western Wall, Judaism's holiest site, in Jerusalem's Old City, earlier this week. While in the Holy Land, the pontiff extended an invitation to the presidents of Israel and the Palestinian Authority to join a prayer meeting at the Vatican. Pope Francis is hoping to demonstrate the power of prayer next week when Israeli President Shimon Peres and Palestinian President Mahmoud Abbas join the pontiff at the Vatican for an exercise in peace building. Reuters describes his invitation to the two leaders to join him at the Vatican for a joint prayer meeting as one of the "boldest political gestures" for Francis since he became pope in March 2013. Vatican spokesman Father Federico Lombardi tells Reuters that the two had accepted that the meeting would take place on a Sunday afternoon. That morning the pope will be presiding at a Pentacost Sunday service in St Peter's Square. The pope, who made the surprise invitation at the end of a Mass in Bethlehem last Saturday, told reporters on the plane returning to Rome that he was not getting directly involved in the stalled Mideast peace process, something he said would be "crazy on my part." "Courage is needed to do this and I am praying to the Lord very much so that these two leaders, these two governments, have the courage to move forward. This is the only path for peace," Francis said on the plane. Speaking earlier in Bethlehem, the pope said: "Building peace is difficult, but living without peace is a constant torment." The Vatican says both Peres and Abbas immediately agreed to the meeting and approved the June 8 date.